American Towelette Company Riverside Manufacturing is a Contract Packager of Private Label single-use moist towelettes and pouches. We are located in rural Mohave Valley AZ, in the tri-State area where Laughlin NV, Bullhead City AZ, and Needles CA meet, just 2 hours from Las Vegas. Our manufacturing plant, office, warehouse and storage areas keep our two generation management team actively involved in all aspects of pricing, procurement, production, shipping, receiving, and customer service for the personalized attention we like to give our customers. The business was started in 1990 when we only filled tubes and bottles, and our major customer was the US government. Since that time we have been awarded continuous government supply contracts by the General Services Administration. In 1994 we bought our first F/F/S (form/fill/seal) machine, and today we continue to expand in machine capacity and manufacturing space. Over the years we have developed comprehensive quality processes to help assure that we make our customer’s product according to approved specifications. Our Quality Assurance system has a proven history. We have continuous on-line batch and lot monitoring. Our employees are well trained and quality oriented, and our machine operators believe Quality is a Matter of Pride. While we make most sizes of moist towelettes, the use of the towelette usually dictates the size. If you want a sunscreen towelette that covers the face, neck and hands, then you may want an 8.0″ x 5.0″ towel in a 2.167″ x 3.5″ packet. If you want a platen wipe, you might want a 4″ x 5.25″ towel in a 2.167″ x 2.5″ packet. 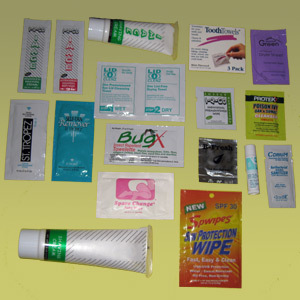 If you want a sting relief towelette, you might a 1″ x 2.5″ towel in a 2.0″ x 2.75″ packet. If you want a self-tanning towelette, you may want a 8.0″ x 6.0″ towel in a 2.5″ x 4.0″ packet. Bigger or smaller, good communication is the first step to letting us know which direction you are heading.We will work together to determine the correct towel material for your project, one that is compatible with your liquid. Then we send you hand samples so you can pick the saturation level needed for your project. We print your artwork onto the outside packet in 1 to 5 PMS colors, or in process printing. With your logo, your customers will always have your information handy. 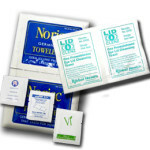 We package your towelettes in bulk, or pack them into POS boxes that you supply. 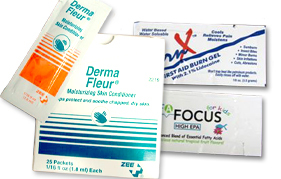 As a Contract Packager, we manufacture and fill pouches to our customer’s specifications. Pouches are made by heat sealing the edges of a laminated flexible substrate. This lamination is often referred to as film. The film is a lamination of several layers of substrates designed to contain a product. The film forms a barrier around the product inside the pouch to isolate the product from contaminations. The pouch inhibits vapor and gas exchanged both inwardly and outwardly so that the product contained remains fresh and ready for use as it was the day it was made. Each pouch has a variety of characteristics and different sizes. We have a United States Government General Services Administration Supply contract. Our contract number is GS-7F-0210K. In fact, we have had a GSA contract continuously since 1994. 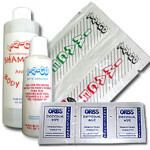 Over the years we have supplied shaving cream and shampoo to federal prisons; sunscreen to state prisons; shampoo to detention centers; shaving cream to the armed forces and refugees in Haiti, Bosnia, Afghanistan, Iraq; sanitizer bottles to many government agencies; hand cleaner towelettes to IRS offices and Post Offices. At American Towelette Company, we make many different sizes of towelettes and liquid-filled pouches, but the use usually dictates the size. If you want 1 gram of hand lotion in a pouch to include in a kit with many other products, then a 1.3″ x 2.5″ pouch will be what you need. If you want a sunscreen towelette that covers the face, neck, arms and hands, then an 8.0″ x 5.0″ towel in a 2.167″ x 3.5″ packet will be what you need. Bigger or smaller, good communication will let us know which direction you are heading. Good communication is essential to be sure that each customer’s needs are documented so everyone involved with production knows what is required to produce each item with the highest quality. Our continual attention to excellence results in a lack of mistakes and in the ultimate customer satisfaction. That’s our reputation, and we work hard to keep it good. 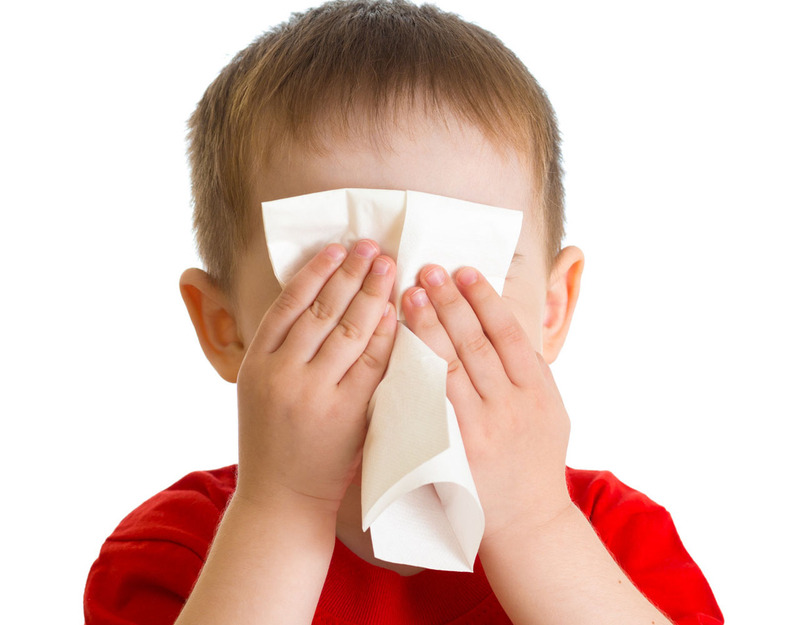 Customers who want us to make their first product are sometimes concerned they will have to order thousands and thousands of towelettes for their first order. We try to calm this fear by including in our quote 5 normal price breaks and 3 Less Than Minimum prices. 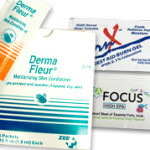 We are a registered FDA Repackager. Our SOPs are up-to-date and followed precisely, including on-going related content training of employees and temporary staff for compliance, regulatory compliance and industry compliance. 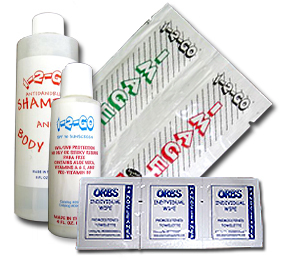 We also have an EPA Facilities Number so we can manufacture any EPA registered product in a towelette, liquid-filled pouch, bottle or tube. We have an on-premise state-of-the-art Machine Shop. This was the result of the need to keep lead times as short as possible. No waiting for parts. 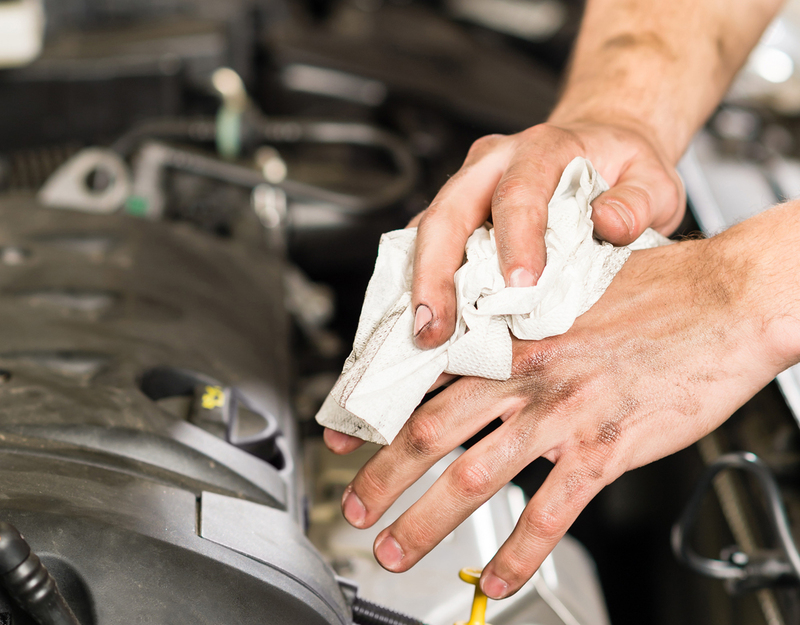 Our well-trained and qualified Repair Department stands ready with the capability of making any part the production machines need, so repairs are done on-site and immediately upon notification of any machine downtime. 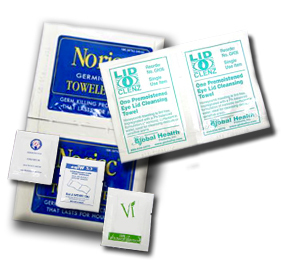 We pretty much make all sizes, but the use of the liquid-filled pouch or towelette usually dictates the size. If you want 1 gram of hand lotion in a pouch to include in a kit with many other products, then a 1.3” x 2.5” pouch will be what you need. If you want a sunscreen towelette that covers the face, neck, arms and hands, then an 8.0” x 5.0” towel in a 2.167” x 3.5” packet will be what you need. Bigger or smaller, good communication will let us know which direction you are heading. Good communication is essential to be sure that each customer’s needs are documented so everyone involved with production knows what is required to produce each item with the highest quality. Our continual attention to excellence results in a lack of mistakes and in the ultimate customer satisfaction. That’s our reputation, and we work hard to keep it good. Cost is determined how many units you order, by the size of the towel, the size of the pouch, how many colors in your artwork, whether your product is bulk packed or packed into smaller packaging. How long does it take to get our product? We strive to keep lead times as short as possible, usually 2 to 3 weeks for repeat orders. First orders to take another week longer. When our busy schedule causes lead times to exceed 4 weeks, we put on another shift so our customers are not waiting for their products. Our facility works one shift. As the workload increases, a 2nd shift is added. We prefer to stay at one shift, so our policy is to add machines to handle increased orders and customers. We have customers that order from 27,000 to 12 million units annually. When we have orders for more than our capacity, we follow our schedule of adding a 2nd shift in preparation for adding machines as needed to keep up with growth. It is our practice to keep ahead of increased workloads by always keeping one machine available to be tooled to handle whatever direction additional orders go. We consider this to be one of our strong points! Your call will be answered by a real person who will direct you to our New Business Department. During this initial conversation, your needs and requests will be analyzed, and your questions will be answered. After the call, your request will be given to the proper Inside Sales Rep who will ready your quote. The person who took your call and your Inside Rep will review the quote to make sure everything has been covered. Quotes are normally emailed, but can be faxed. Follow-up is the job of your Inside Rep. He or she will keep you informed on the progress of your order, from Quote to Purchase Order to Shipment. Can you make our FDA regulated product? We are an FDA registered Relabeler. Our SOPs are up-to-date and followed precisely, including on-going related content training of employees and temporary staff for compliance. Our employees are well trained and quality oriented. Our hiring policy is very efficient. We are careful whom we hire, check out references thoroughly, and provide an enjoyable workplace with an excellent health package; we show our employees appreciation for a job well done; we have a terrific incentive program which monetarily rewards good attendance. All of which we feel is important because we want the same employees producing your product from start to finish so there is nothing that falls through the cracks. All our employees know that their extra effort keeps our customers coming back. We also have an EPA Facilities Number so we can manufacture any EPA registered product in a towelette, liquid-filled pouch, bottle or tube. Copyright © American Towelette, Inc.